I took this photo during one of our walks last week. It feels so great to be able to get outside with the kids and enjoy nature without freezing. That little bit of green is such a welcome sight! Spring is here and all is beautiful and bright. We read and hear poetry every day in picture books and songs but the lyrical verses, for the most part, seem to go unnoticed. National Poetry Month takes place in April. Next month we plan to join others in a celebration of poetry by actively seeking out and reading poems. We hope to discover fun and interesting poetry that specifically appeals to children. We may even try our hand at writing a few of our own verses. My preschool aged daughter is just learning to read and write. 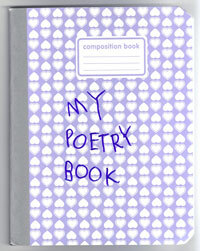 We decided that it would be fun to create a "My Poetry Book" this April. Every weekday we'll select a poem to paste into her book and, after reading the poem aloud together, she will draw an illustration for the poem. Some days I'll encourage her to pick a topic and we'll try to find a poem that fits the theme. Other days we may discuss different types of poetry like haiku or limericks. We'll go to the library, pick out a few poetry books and blindly pick a page to read. Along the way we'll try to update our readers on the progress and post a few entries. By the end of the month, her little poetry book will overflow with special poems and pictures that inspire. Poets.org - A super resource for National Poetry month, it includes information on celebrations and festivals and suggestions on how to participate. Download the 2010 National Poetry Month poster. Need inspiration? Check out 30 Ways to Celebrate. Don't forget National Poem In Your Pocket Day on Thursday, April 29, 2010! Crayola National Poetry Month page - includes several printables and activity ideas. I really like the Crayola Poetry Coloring Page that encourages children to color and create their own short poem by arranging words. Kidlitosphere Celebration of Poetry Month - several kidlit bloggers have decided to write poetry related posts during April. Click on the link to view the full list of participants and their chosen themes. National Poetry Month Blog Tour 2010 - Savvy Verse & Wit is hosting the month-long blog tour. Visit a new blog everyday. 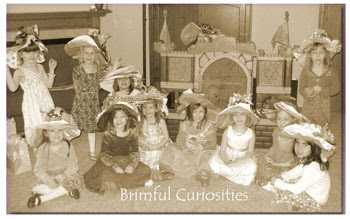 Brimful Curiosities is participating -- watch for our post on April 30th. Book Spine Poems - Stack books on top of each other so that the titles form a verse. Submit your book spine poem to 100 Scope Notes for inclusion in his gallery. Poetry Foundation - A collection of articles and videos on children's poetry. Also includes a Children's Poetry Archive. 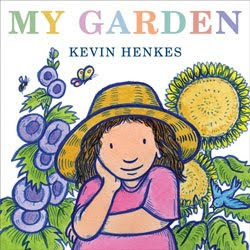 Sourcebooks free ebook - In celebration of National Poetry Month, Sourcebooks is offering My Hippo Has the Hiccups by Kenn Nesbitt for free online. You can turn the pages and even listen to audio recordings of the poems. Giggle Poetry - Want some fun poems and activities for kids? This is a great place to start. Storyworks - Another Scholastic resource, this site has great poetry and writing lesson plans. "The Secret Song" by Margaret Wise Brown is one of the April/May 2010 Storyworks featured poems. Scroll down to find the poem and the corresponding activities. J. Patrick Lewis Bookmark Poems - Mark your place in April with these fun printable poetry bookmarks. Chronicle Books Chicken Scratches Contest - Start the month off by filling in the blanks of a few of George Shannon and Lynn Brunelle's poultry poems. Hurry though! All guesses must be in by April 2nd. “Paws for Poetry” Contest - children ages 5-12 are to write a poem to, and provide a photo of, their favorite animal friend. The contest is cosponsored by Meet Me at the Corner and Flashlight Press. Entries due 4/15/10. Do you know of any other excellent poetry resources or activities for children? Can it be? Easter is less than a week away. 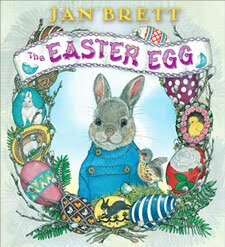 Therefore, it is only fitting that the majority of our reading this week will consist primarily of Easter and spring themed books. Here is a roundup of the books published in 2010 we've already had the chance to read together. Our list of "to-be-reads" continues to grow and you'll find that list at the bottom of this post...hope we can locate some of them at our library before the week ends! Book Source: Review copy provided by publisher. A little girl imagines what her ideal garden would contain. Our full review here. 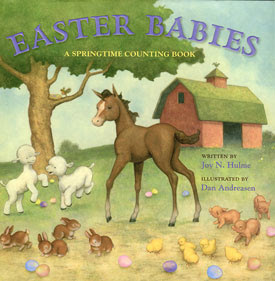 Celebrate new life in this springtime counting book full of cheerful, sweet baby animals on the farm. Our full review here. 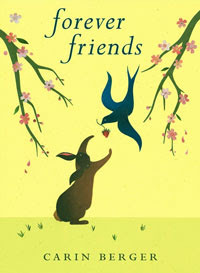 A bird and bunny become instant companions one spring and, after a wintertime separation, learn what it means to be "forever friends." Our full review here. A caring and thoughtful bunny named Hoppi hopes to design the perfect egg -- one that will catch the attention of the Easter Rabbit and earn him the honor of helping that most important rabbit on Easter morning. Our full review here. In this humorous story, the Easter Bunny catches a cold and asks T. Rex to fill in. The large dino lacks a soft touch and unfortunately breaks all the eggs. His friends come to the rescue, and on Easter morning the children end up with some unexpected surprises. Jack E. Davis illustrates a hilarious looking dinobunny that wears bunny slippers, floppy ears and taped-on whiskers. Nancy is having a fancy Easter gala in her home and works on decorations with her friend, Bree. They set a fancy table with flowers, pretty napkins, plates, balloons and a lovely egg-shaped cake, but Nancy worries that one detail may be missing. Fancy Nancy wears an egg and chick hat and Bree's hair is decorated with eggs and butterflies. The lift-the-flaps on each page make this interactive book a delight for Fancy Nancy fans, especially the younger readers! Mouse from Numeroff's "If You Give a..." series is back in this Easter board book. He decorates Easter eggs, and when he wakes up Easter morning, he discovers that someone hid the colorful eggs all over the house. The short, simple story is perfect for toddlers who are trying to learn their colors and how to count. Little kids love a good Easter egg hunt. Toddlers will enjoy helping a little girl search for Easter eggs in this touch and feel / lift the flap interactive board book. My kids especially liked the glittery page. Obviously we're not limiting ourselves to only those books published in 2010. If you know of a must read Easter or spring themed book please let us know in the comments. I am an Amazon affiliate and may receive a very small commission for products purchased through my Amazon links. View my full disclosure statement for more information about my reviews. A couple weeks ago, while reading a post on the wonderful Bookie Woogie blog, I learned about JellyTelly. JellyTelly is an online Christian TV series by VeggieTales creator Phil Vischer. Kids learn about the Bible by watching the free daily shows. The short segments feature cartoons, puppets and real-life characters. Focus on the Family partners with Vischer on the show. While the daily shows are free for all to watch, subscribers can access all the content on the site. Here's a clip from the show. There's a verse of the week, episodes like the one above where kids can learn about books of the Bible, JellyTelly jokes and a silly Sunday School lady. My daughter likes to watch the show, and I highly recommend it as a useful and entertaining resource for Christian families. This month Tyndale House Publishers released a DVD video series called What's In The Bible? Many of the JellyTelly characters appear in the DVDs. We haven't had a chance to watch them yet, but I think that they sound like a wonderful way to learn about the Bible at home. Have you watched JellyTelly or the new DVD series? What did you think? Hello, to all those who frequent my list. I'm asking a small favor this week. If you have a chance before you browse the contests, stop by my Library-Loving Blog Challenge post and leave a comment. You comment, I donate...simple as that! Show some library love! Janice VanCleave's Chemistry For Every Kid: 101 Easy Experiments That Really Work! Dreamcatcher's Lair - Book Giveaway Ends ?? 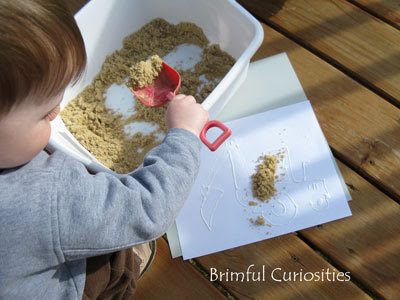 We went outside to explore the other day and opened up our sandbox. YUK! Somehow, despite a lid, the sand inside the turtle shaped box became a soggy, digusting, greenish tinted mess over winter. No sandbox playing for us until we remove the old sand, sanitize and fill with some new, non-green sand. In the meantime, I filled a small dish tub with some sand so the little guy could play in the sand. 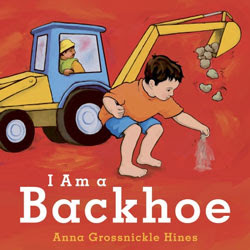 He's been talking about sand and pretending to be large machines thanks to our latest read: I Am a Backhoe by Anna Grossnickle Hines. I love watching little boys play. They can turn any inanimate object into a roaring, loud truck and entertain themselves for hours in this imaginative type of play. I'm pretty sure it's an innate ability they possess from birth. Sometimes they even pretend to turn their own bodies into the truck, bulldozing and digging away. No toys needed when you have an active imagination! In the book, I Am a Backhoe , a barefoot little boy pretends to be all sorts of machines - a backhoe, bulldozer, crane truck, dump truck and roller. In the end, Daddy joins in the fun, and carries the little boy on his strong "flatbed truck" back, and they share a quiet moment reading together about...TRUCKS! Get ready to bend, lift, and back up with some beep, beeping. This picture book is packed full of fun actions and sounds to mimic. The bold, bright illustrations and fun actions make this the perfect book for all truck loving boys. Plus, the illustrations show a dad reading to his son, and all dads out there should definitely pick this one up and read it with their boys (and girls). My daughter enjoys a little imaginative truck play once and awhile, too, especially when Daddy takes the lead. 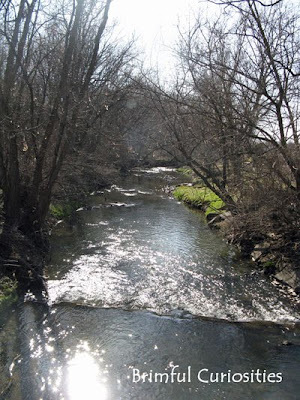 Author Anna Grossnickle Hines posted an interesting "behind the story" article on her website. The book was inspired by her grandson, Emmett, as she watched him play in the park one day. She describes how she used digital art to create the images in the book. My son spent a little time dig, dig, digging in the sand for our stART project this week. 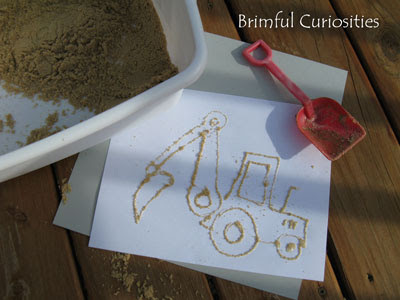 We made a backhoe sand picture together. I traced an image of a backhoe with some white glue. We went outside and my son piled sand on top of the picture and pretended to be a backhoe. He was so surprised when we dumped the sand off and a digger appeared! I would have let him make his own drawing but we are almost out of glue. I'll have to buy another bottle so he can experiment. By the way, if you have a moment, stop by my Library-Loving Blog Challenge post and leave a comment. You comment, I donate...simple as that! We love our local library! A Mommy's Adventures hosts the "stART" meme (Story + Art) each week. 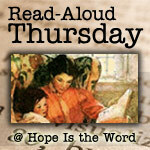 Hope Is the Word hosts a Read Aloud Thursday link-up as well. I am an Amazon affiliate and may receive a very small commission for products purchased through my Amazon links. Fantastic Fiction for Kids posts every Wednesday on the lovely Playing by the book blog. This week I'm the contributing blogger and have recommended some of our favorite princess, prince and frog picture books. I apologize in advance because many of them are out of print, but finding worthy and well illustrated retellings of the popular Frog Prince story was not an easy task. Please do stop on over for a visit and leave a comment. 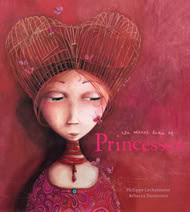 Speaking of princesses, Sterling Children's books plans to release a marvelous princess themed book this June 2010 titled The Secret Lives of Princesses by Philippe Lechermeir. I recently had a sneak peak at the work and, low and behold, the pond dwelling, frog kissing princess makes an appearance in this very interesting compilation of unusual princesses (many of them never seen before). Now I can't say much more about it, but if you think you've already read everything there is to read about princesses, this upcoming book promises to delight and surprise you with fantastical illustrations by Rebecca Dautremer. Expect a full review here at a later date! To further entice you, check out the book's website. I see a little of myself in the bookworm Princess Paige. Or become a fan on Facebook and be the first to learn when new princesses are revealed. 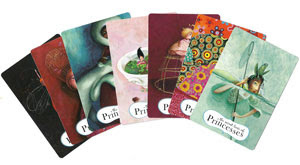 Sterling has graciously offered to giveaway a pack of The Secret Lives of Princesses Puzzle Cards to (10) different Brimful Curiosities readers. Each pack includes seven different cards featuring various princesses and a logic puzzle to solve. After receiving the cards the winners can visit the website and crack the code using the cards to unlock a special prize! • Contest ends on Monday, April 5th, 2010 at 11:59 PM CST. I am an Amazon affiliate and may receive a very small commission for products purchased through my Amazon links. Sterling provided me with a advance reader copy of The Secret Lives of Princesses and some packs of The Secret Lives of Princesses Puzzle Cards for review purposes. Ooh. Aah. Isn't my mom talented? The latest fancy birthday cake creation. 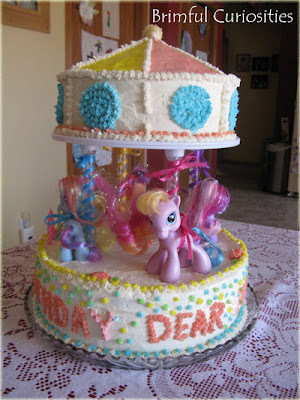 Grandma made a My Little Pony carousel birthday cake for my daughter's birthday. We utilize our own public library nearly every single week. We check out primarily children's materials, but both my husband and I also check out books when we find the time. He listens to audio books, and I like to read Christian and other fiction. 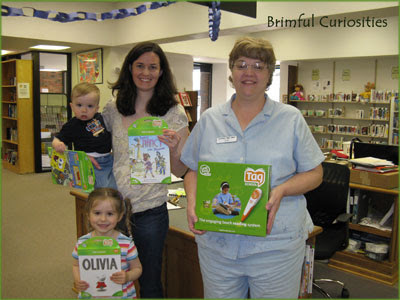 We've also attended several library programs. So when I learned about this week's 2010 Library-Loving Blog Challenge, I knew I wanted to participate. Wisconsin has a large and expansive library system comprising of seventeen public library systems with nearly 400 public libraries. According to the Campaign for Wisconsin Libraries, "Wisconsin public libraries serve a total state population of 5.6 million and in the past 10 years, library visits have grown by 28 percent." Please note that my pledge is “per commenter”—so if a single person leaves 50 comments, that still only counts once! But you can do more by spreading the word … please link to this post, tweet about it, and send your friends here so they can comment and raise more money. If you’re moved to make a flat-fee donation to your library, or to start your own challenge, please take a moment to do so. Every bit counts! When I told my friends about my plans to invite 15 of my daughter's friends to a princess tea birthday party they looked at me like I was insane. I figured I could handle the girls. After all, I'd organized several library storytimes programs and never had any real problems. Plus, when you invite kids to parties, only about half attend, right? Well, the event was more popular than I expected and in total, 12 girls attended the party for my daughter's birthday. The 12 DANCING PRINCESSES. I enlisted the help of my mom and mother-in-law and we all had a great time--kids and adults. Here are a few pictures of the day and the activities. When each of the girls arrived, we ushered them into the millinery (hat making shop) to create their own personal tea party hat. 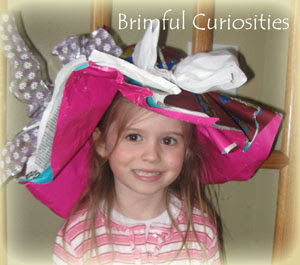 I saw the idea for a wrapping paper high-tea hat in a Family Fun magazine issue a while back and thought they would be so fun to make at a tea party for little girls. A newspaper version and more detailed directions can be found at maya*made. The girls each chose their own wrapping paper pattern and a ribbon and tissue paper butterfly to personalize the hat. The hats are so simple to make, but look very sophisticated! After the hat making the girls worked on coloring some princess placemats I made by printing a coloring page on legal sized paper. I supplied some small princess stamps from the dollar store for a little stamping fun, too. This activity kept some of them occupied while others finished making the hats. When everyone sat down at the table, I brought out bowls full of magic coloring changing beads from Steve Spangler Science. I told the girls that the beads had magical qualities and would change colors when they placed in sunlight. They threaded the beads onto pipe cleaners to make bracelets. My daughter is wearing her bracelet in the top picture. 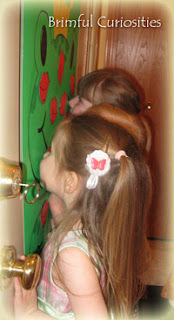 Every princess must eventually kiss a frog so we played a pin a kiss on the frog game. It's a version of pin the tail on the donkey. 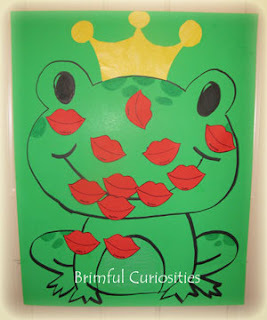 I drew a picture of the frog prince on a green piece of tagboard, cut out several red lips and wrote each girl's name them. I bought a pink satin sleep mask at the dollar store and used it to blindfold each girl so that they could blindly "kiss the frog." Each princess received a sparkle ring as a token of appreciation for their kindness to the frog. Later on some of the girls decided to give the frog a real smackeroo! While the grandmas worked to set up the food and drinks, the girls danced to a few songs. I checked out the Disney Princess Tea Party CD from the library and we danced to one of the princess songs. Since my daughter turned five years, we also played the song "High Five!" from They Might Be Giants Here Come The 123s . The girls gave each other high fives to the disco beat. 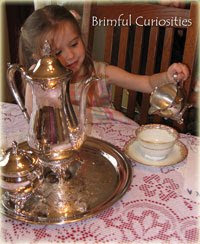 My grandmother loaned us her beautiful silver tea set to use for serving our apple juice tea. I brought out my fine Noritake china tea cups and saucers and the girls excitedly drank their tea. They all exclaimed that they had never drank out of real tea cups before. We served finger sandwiches, fruit, and an assortment of cookies. Instead of serving a birthday cake (kind of messy for a fancy tea party) I made mini brownie cupcakes in my mini muffin pan and topped them off with some fancy whipped cream. After opening presents, the girls each received a favor basket with their own small tea set, a princess activity book and a bag of mini Chips Ahoy! cookies. Just in case we ran out of activities, I checked out a couple princess books from the library to read aloud. We never had time for storytime, though! The 12 princesses were too busy making their own special memories and enjoyed the afternoon event to the fullest! I'm dreadfully overdue getting this list out, but in all honesty the last two months have been rather trying. Since the middle of January I don't think we've gone a week without someone sick in our house. Just as we'd finally start recuperating from one, someone else would end up ill. On top of that, my toddler son has started waking up twice a night, screaming. Not sure if he's having night terrors or just can't self soothe, but the lack of sleep is starting to wear me down. Needless to say, the blog has suffered some. My reviews have been sporadic, and I'm just now getting around to this winners list. Please accept my apologies, and I hope that we have a healthier spring! As always, thanks for reading and watch for more contests to enter. It's All Too Much, So Get It Together Book. The winner is Marci (june_spirit2628) (comment #17). SpongeBob SquarePants: Viking-Sized Adventure DVD. The winner is cdziuba (comment #4). Sleeping Bear Press Black History month book giveaway. The winners are Heather (comment #25), Katrina (comment #16) and Mama Jenn (comment #20). Mandy and Pandy Play Sports Book. The winner is Uniquely Normal (comment #38). Obviously eggs, books and a little candy belong in all Easter baskets. But, the Easter Bunny often includes small toys and gifts in the kids' Easter baskets, too. Here are some of our favorite smallish toys that would work perfectly as gifts on Easter day. Watercolor pencils and paper - Watercolors remind me of spring and kids can easily produce impressive art using watercolor pencils. Draw then paint with water. My daughter really enjoys using our set of STAEDTLER karat aquarell pencils, but there are plenty of other brands available for purchase. I'm looking for suggestions to add to this year's wish list - what are some small toys or gifts that your kids love that mine might enjoy?